The facts are consistent: our Christian faith stands up to scrutiny in every respect. Examine the Evidence will systematically ground you in this life-changing reality and show you how to vouch for it in a broken world. The facts are consistent: our Christian faith stands up to scrutiny in every respect. Examine the Evidence® will systematically ground you in this life-changing reality and show you how to vouch for it in a broken world. 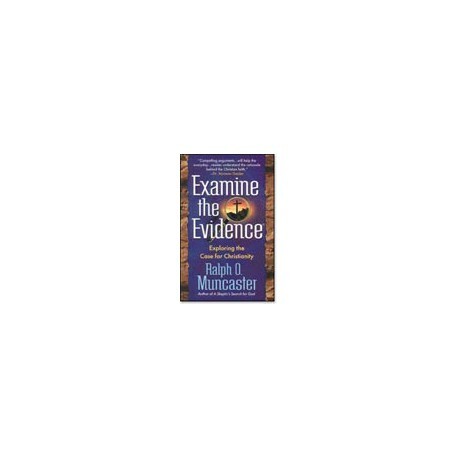 Ralph Muncaster's practical, integrated approach leads you through major areas of the evidence that confirms Christianity – the design of the cosmos, history, scriptural prophecy, the Bible's reliability, the uniqueness of Jesus, and more. Whether you study alone or in a group setting, numerous special features are designed to help you retain what you read. This book aims to be your personal program, helping you to discover the evidence supporting Christianity. It will lead you into a stronger faith, an increased love for God and prepare you to share the truth of Jesus with confidence.